It took a very long time, following the Great Depression, for a consensus to emerge as to what had gone wrong. It is taking world leaders a similarly long time to realise that the Global Financial Crisis was not just an unfortunate, one-off accident, but was the culmination of three decades or more of mistaken economic policies. It is significant that it is those economies whose leaders have been slowest to recognise this that have remained most stubbornly in the economic doldrums. But even there, a change of heart is under way. The euro zone is the most obvious example of a refusal to learn the lessons. But the IMF has, over recent months, changed its mind and made it painfully clear that austerity for Greece and other euro zone economies is not the answer and that a more flexible policy, allowing debtor countries to grow their way out of debt, is now required. And the UK, still mired in recession and committed to austerity, has nevertheless experimented with quantitative easing (or printing money), while the incoming governor of the Bank of England, Mark Carney, has already indicated his interest in adopting a nominal GDP target rather than inflation as the preferred goal of monetary policy. Leading British monetary economists like Adair Turner and Michael Woodford are publicly debating which precise mechanisms of both fiscal and monetary policy will be most effective in improving liquidity for business; they recognise that the quantitative easing practised so far has had the effect of merely strengthening the banks’ balance sheets. Elsewhere, change is even further advanced. President Obama, in the face of determined and obstructive opposition from his Republican opponents, has succeeded in pulling the US economy out of recession and back on the road to recovery – and here, too, the Federal Reserve continues to stimulate the economy by systematically increasing the money supply. Perhaps the most dramatic shift in policy has occurred in Japan, where Shinzo Abe’s government has abandoned the restrictive policies of the last decade or so and has reverted to the kind of expansionary policy, based on credit creation for productive investment, that served the Japanese economy so well in its rapid growth phase of the 1960s and 70s. Then, there are of course the most successful economies – like China or Singapore – that have in their different ways always eschewed the Anglo-American insistence that the market must always prevail and must never be second-guessed by government. They have demonstrated that business does best when macro-economic policy provides them with an environment that is conducive to economic development. Even in Europe, the most successful economies are those, like Germany and Switzerland, whose governments have ensured that their industries are not handicapped by factors, like overvalued exchange rates, that make them uncompetitive in world markets. Here in New Zealand, our leaders seem oblivious to these developments. We seem to think that we have nothing to learn from other – and generally more successful – economies. We tell ourselves – as we sink back into our old failings of an inflated Auckland housing market, and increased spending on imports made artificially cheap by an overvalued dollar (with the consequent harm to our own producers, and a larger trade deficit that has to be financed by more borrowing and asset sales) – that we must not waver from applying the same old mistaken policies. We have such a short time-span that we refuse to ask ourselves how it is that – over three decades – other economies have done so much better. 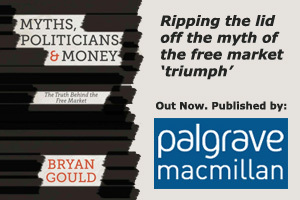 We are so far removed from any rational debate on these issues and so focused on deficits and public spending that we scarcely recognise the terms, let alone the policies, that are adopted as a matter of course by the new powerhouses of the world economy. Those economies focus on issues that are of crucial importance, like competitiveness and liquidity, manufacturing and an industrial strategy, full employment and productive investment – words that scarcely feature in our economic discourse. While the Swiss and the Singaporeans target competitiveness so that they can sell everything they produce at a profit, we pay the issue no attention. While the Japanese and Americans quite consciously use monetary policy to bring their currencies lower, we do the reverse. While the Chinese ensure that their industry is constantly supplied with credit-created capital so that they can both invest in and buy new capacity (how else do you think they can afford to buy up so much of others’ economies? ), we focus on cutbacks and putting people out of work. While the Chinese, Japanese, Germans, Singaporeans, and many others give their primary focus to manufacturing, we are content with a narrowing productive base in primary industry and selling off whatever remains. But even here, change is afoot. The report on manufacturing, published by the opposition parties, is a belated recognition that we cannot go on as before. And there is a glimmer of hope even at the Reserve Bank. The new governor at least seems to understand that the overvalued dollar, the fall in saving and rise in imports, and the Auckland housing bubble are danger signals. The solutions are available, if only we care to look. Previous: Are Civil Servants Disposable?